How social networks, the personalized Internet, and always-on mobile connectivity are transforming-and expanding-social life. Daily life is connected life, its rhythms driven by endless email pings and responses, the chimes and beeps of continually arriving text messages, tweets and retweets, Facebook updates, pictures and videos to post and discuss. Our perpetual connectedness gives us endless opportunities to be part of the give-and-take of networking. Some worry that this new environment makes us isolated and lonely. 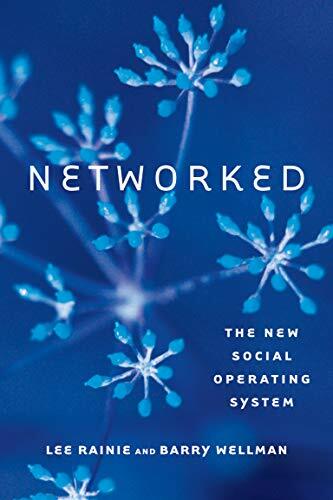 But in Networked, Lee Rainie and Barry Wellman show how the large, loosely knit social circles of networked individuals expand opportunities for learning, problem solving, decision making, and personal interaction. The new social operating system of "networked individualism" liberates us from the restrictions of tightly knit groups; it also requires us to develop networking skills and strategies, work on maintaining ties, and balance multiple overlapping networks. Rainie and Wellman outline the "triple revolution" that has brought on this transformation: the rise of social networking, the capacity of the Internet to empower individuals, and the always-on connectivity of mobile devices. Drawing on extensive evidence, they examine how the move to networked individualism has expanded personal relationships beyond households and neighborhoods; transformed work into less hierarchical, more team-driven enterprises; encouraged individuals to create and share content; and changed the way people obtain information. Rainie and Wellman guide us through the challenges and opportunities of living in the evolving world of networked individuals.